In 2015, our district in convention approved a resolution that began an effort to enhance the quality of our Christian education, both in the parish and in schools, through a fundraising appeal. This became known as To All Generations. With the words of the Psalmist in Psalm 145:4, we find these meaningful words: “One generation shall commend your works to another, and shall declare your mighty acts.” And so it is that in our churches and schools and in our homes, the faith that professes Jesus Christ as Lord has been passed down from generation to generation. Since beginning this To All Generations appeal, we’ve conducted a feasibility study, met with individual donors, held area meetings with leaders from across the district, and have seen firsthand the generosity of God’s people coming together to enhance the teaching mission of our church. And now, as we prepare to celebrate the completion of this appeal at our June convention, we want to give the members of our congregations an opportunity to come together to support Christian education. 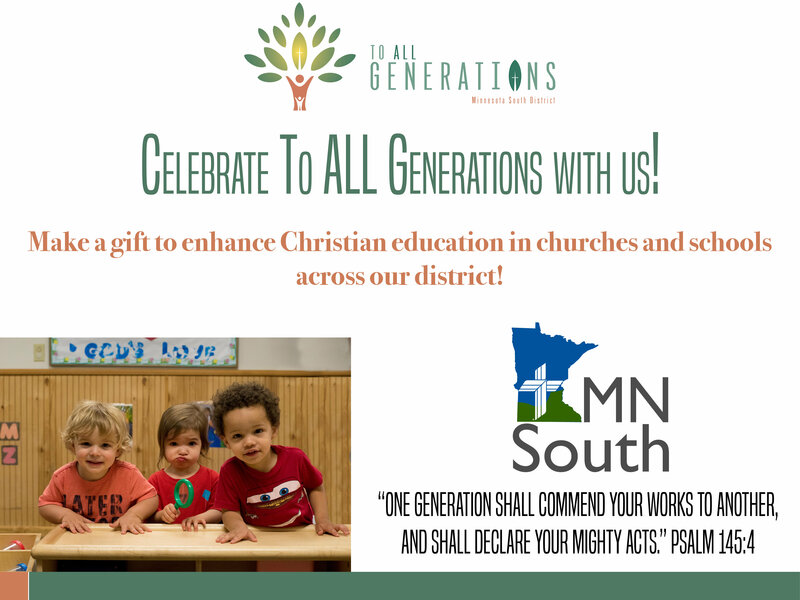 We thank the many congregations that have stepped forward to share the “to All Generations” story. If you have not yet shared the story with your members, we would like to provide you one last opportunity to utilize our resources to use in your congregations to promote To All Generations. We encourage you to use one or more of the Sundays in May or June prior to the district convention to share these resources with your members. We encourage you to consider how you might solicit gifts for To All Generations in your congregations. You may decide to hold a door offering, or encourage individuals to mail their gifts to us or give online. Additionally, since the offering at the district convention will be dedicated to the To All Generations effort, you may want to bring your congregational gifts there. Whatever you decide, and however God moves your members to give, we appreciate them having the opportunity to hear the story of TAG and respond with a gift. Gifts of any size allow more grant dollars to be available to enhance Christian education in churches and schools across our district. For more information, visit mnsdistrict.org/tag or email sean.martens@mnsdistrict.org.